Thanks for your interest in Kaizen and continuous improvement. An increasing number of healthcare organizations are embracing this approach as a way of improving quality and safety (for patients and staff), improving the patient experience, and reducing cost. A “Kaizen” is a small improvement that is made by those who do the work. It is a small, low-cost, low-risk improvement that can be easily implemented. Kaizen is an ongoing methodology and philosophy for challenging and empowering everyone in the organization to use their creative ideas to improve their daily work. Beyond the measurable results, Kaizen organizations value the personal and organizational learning that results from the improvement process, as well as the personal pride and satisfaction of all who are involved. Kaizen. It is a strange-looking word. It might seem a little difficult to pronounce. Said out loud, it sounds a lot like “try–zen,” and we can equate it with the idea that we can try to improve and make things more zen-like in the workplace. Yes, Kaizen leads to a calmer, better-organized, more productive workplace that provides better patient care. Kaizen seems like a simple concept, really. But is this Japanese word intimidating to people in healthcare workplaces outside of Japan? Does the broader idea of improvement scare or intimidate people at all levels? Hang in there, as this little word might be one of the most powerful words and concepts for improving healthcare processes and quality. Hospitals around the world are using this concept, often as part of a broader “Lean management” initiative. The period of “Lean healthcare” adoption that started around 2000 has proven that hospitals and healthcare organizations can improve when we have a highly engaged workforce focused on providing value to patients and minimizing waste in the delivery of care. Many organizations embrace the idea of Kaizen and practice its specific principles, but they call it Continuous Improvement, Process Excellence, or Plan-Do-Study-Act (PDSA) instead of Kaizen. That is perfectly fine; what we call it does not matter as much as the patient benefits, staff engagement, and organizational improvements that we achieve with these practices. Everybody knows that healthcare organizations and professionals around the world are under a lot of pressure to improve. The need for improvement includes the dimensions of quality and patient safety, cost, waiting times, and the morale of healthcare providers and employees. Kaizen is proving to be part of the solution to these problems. 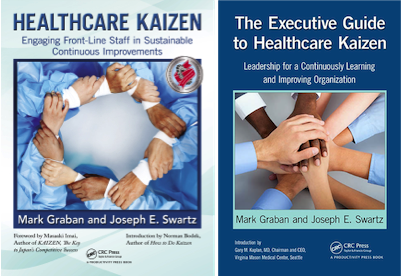 Read more in Healthcare Kaizen and The Executive Guide to Healthcare Kaizen. One other key point about kaizen is that leaders can’t just ask employees to look for cost savings. Experience has shown that healthcare professionals don’t get very excited about saving money as a primary goal. They do, however, get very excited about reducing the risk of harm to patients, improving the patient and family experience, and reducing frustrations and irritations that continually appear in their workdays. The good news is using kaizen to focus on the types of improvements that engage people will yield cost savings (and sometimes increased revenue) as an end result. Many kaizen ideas naturally bubble up based on the problems front-line staff members see on a daily basis. But leaders also can ask employees for ideas that tie to a hospital’s balanced scorecard or "true north" goals and objectives. (via the Institute of Industrial Engineers).